Kanadaren banaketa administratiboa - Wikipedia, entziklopedia askea. Toronto (Ontario): 5.304.600 biztanle (2005). Vancouver (Britainiar Kolunbia): 2.208.300 biztanle. ↑ Census Profile Statistic Canada, statcan.gc.ca . Noiz kontsultatua: 2013-8-6 . ↑ Reader's Digest Association (Canada); Canadian Geographic Enterprises The Canadian Atlas: Our Nation, Environment and People Douglas & McIntyre ISBN 978-1-55365-082-9 . ↑ a b Population and dwelling counts, for Canada, provinces and territories, 2016 and 2011 censuses – 100% data Statistics Canada, statcan.gc.ca . Noiz kontsultatua: 2017-2-8 . 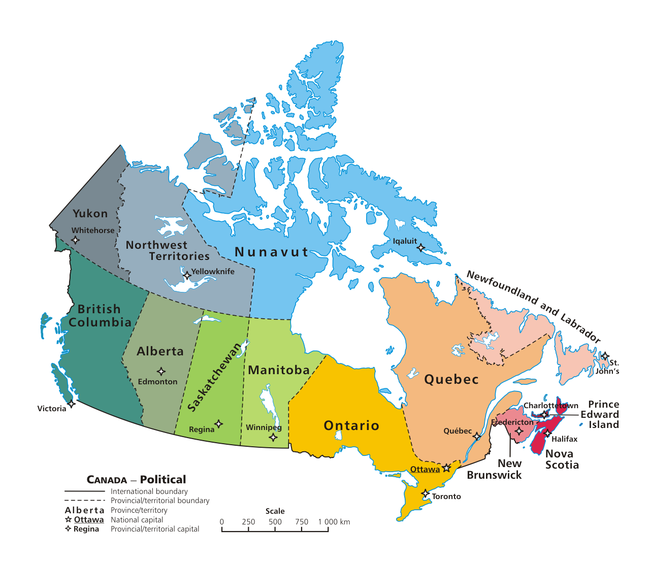 ↑ a b c d e f Land and freshwater area, by province and territory Statistics Canada, statcan.gc.ca . ↑ Coche, Olivier; Vaillancourt, François; Cadieux, Marc-Antoine; Ronson, Jamie Lee Official Language Policies of the Canadian Provinces Fraser Institute, fraserinstitute.org . Noiz kontsultatua: 2012-8-6 . ↑ OCOL – Statistics on Official Languages in Yukon Office of the Commissioner of Official Languages, ocol-clo.gc.ca . Noiz kontsultatua: 2013-8-6 . ↑ Nunavut's Official Languages Language Commissioner of Nunavut, langcom.nu.ca . Noiz kontsultatua: 2013-8-6 .